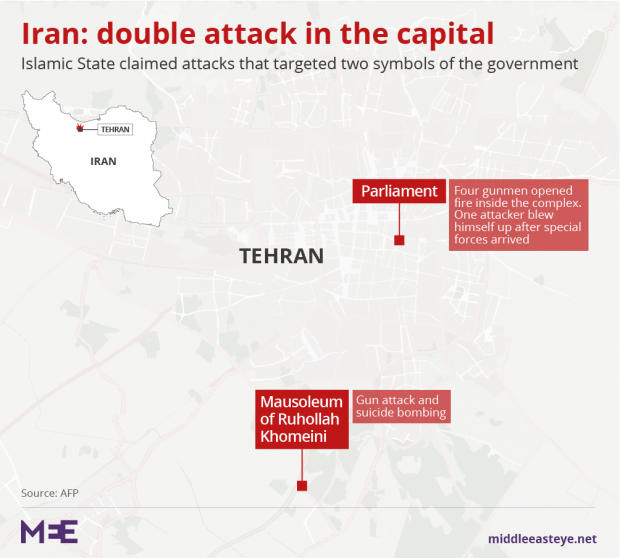 The Islamic State group has claimed attacks on Iran’s parliament and the Mausoleum of Ayatollah Khomeini a few kilometres south of the capital on Wednesday morning, near simultaneous assaults that killed up to seven people, according to media reports. 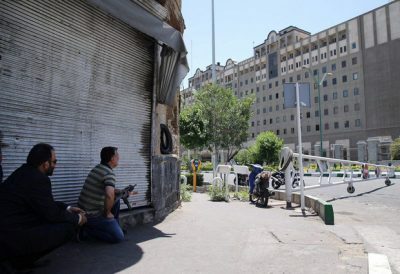 A security guard was killed when four gunmen burst into Tehran’s parliament complex, while a gardener was reported dead when several armed assailants entered the grounds of Khomeini’s mausoleum in the south of the city, according to the ISNA news agency. “Fighters from Islamic State attacked Khomeini’s shrine and the Iranian parliament in Tehran,” IS’s news agency Amaq said. An official at Khomeini’s mausoleum in south Tehran said “three or four” people had entered via the western entrance and opened fire, killing the gardener and wounding several people, according to the Fars news agency. Fars said a female suicide attacker blew herself up outside the shrine and published photos showing the explosion. The Mizanonline news agency also said a female suicide bomber blew herself up outside the shrine, while another woman was arrested carrying six grenades. Lawmaker Elias Hazrati told state television three assailants, one with a pistol and two with AK-47 assault rifles, raided parliament. Parliament was in session as the attacks unfolded, with live footage showing members continuing with routine business even as gun battles were reported in surrounding office buildings. Speaker Ali Larijani dismissed the attacks, saying they were a “trivial matter” and that security forces were dealing with them. Intensified gunfire was heard from the neighbouring offices as Fars news agency reported police had launched an assault. Tasmin news agency said there were unconfirmed reports that the attackers had taken four hostages inside the parliament building, but the state news agency IRNA reported that the situation at parliament is under control and a session is going ahead. Another lawmaker said one of the assailants was surrounded by security forces and all the doors to the building had been closed, ISNA news agency reported. Several Arab media outlets claimed that the Islamic State group carried out the attacks, but removed the news report from their websites after half an hour, according to the semi-offical Fars News Agency. Around half an hour later and 19 kilometres away from the parliament building, an armed man opened fire at the Mausoleum of Ayatollah Khomeini and wounded a number of people, the semi-official Fars news agency reported. Ayatollah Ruhollah Khomeini launched the Islamic revolution in 1979.